What does a Chemical Engineer from Purdue know about digital marketing? Turns out, plenty! Kevin Hofer has been working with Chuck Tate on developing websites since the beginning. Both worked at the same chemical company when it seemed that their careers were going to take a very different direction. 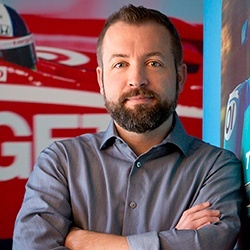 But just as Chuck has a passion for racing, Kevin had an extreme interest in web technology and how that can be leveraged to help businesses. While living in Chicago, Kevin read every book he could get his hands on related to web design and development. Ultimately, he taught himself enough to land a development job with a sports marketing firm in the windy city where he worked on the websites of many professional sports teams and leagues including: Buffalo Bills, Chicago Bears, Chicago Blackhawks, Chicago White Sox, Dallas Stars, Minnesota Wild, New York Giants, Pittsburgh Steelers, San Francisco Giants, Seattle Seahawks, Washington Capitals and the YES Network. In 2002, Kevin received the fateful call from Chuck Tate asking him to join Digital Momentum (which, at that time, was named RACERSITES). Kevin began working with Chuck remotely before making the move south to Charlotte to join the team. Kevin is the team lead for the majority of the clients and devotes his time to building client relationships and building a model of interactive solutions that are purpose built for their needs. Kevin lives in Charlotte with his wife (Laurie) and two kids (son, Preston and daughter, Emerson), enjoys live music and cheering for his hometown Chicago sports teams.